Birth date, location November 7, 1964 - Dominican Republic? Of the multiple wrestlers who've wrestled as Hijo de Pierroth, this one had the most traction as a steady CMLL midcard rudo. Like the others, he was of no actual relation to Pierroth, but decided to keep a variation of the gimmick as Pierko el Boricua after Pierroth took the name back and CMLL dropped him from his roster. It's been acknowledge that Pierko is the wrestler formerly known as Salsero. While he was Hijo de Pierroth, he'd mock Salesero's trademark salsa dance and even referred to himself as "El Hijo del Salsero" to the announcers. It's no big secret after changing gimmicks. There's another Hijo de Pierroth who popped up in IWRG in 2008, but it doesn't appear to be this wrestler or other ex-Hijo de Pierroth. As of 2009, he has become a regular in Monterrey working at Arena Coliseo De Monterrey and more recently Arena Solidaridad. 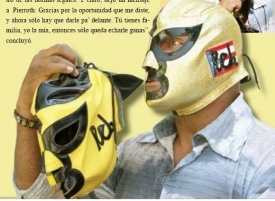 He worked the first Lucha Libre USA: Masked Warriors taping under the name El Limón wearing his old Hijo del Pierroth mask and gear though he has not appeared since. 99/09/13 hair Pierroth Jr. Salsero Plaza de Toros Lauro Luis Longoria - Nuevo Laredo, Tamps.